Zonal statistics is a technique to summarize the values of a raster dataset overlapped by a set of vector geometries. The analysis can answer queries such as "Average elevation of each nation park" or "Maximum temperature by state". 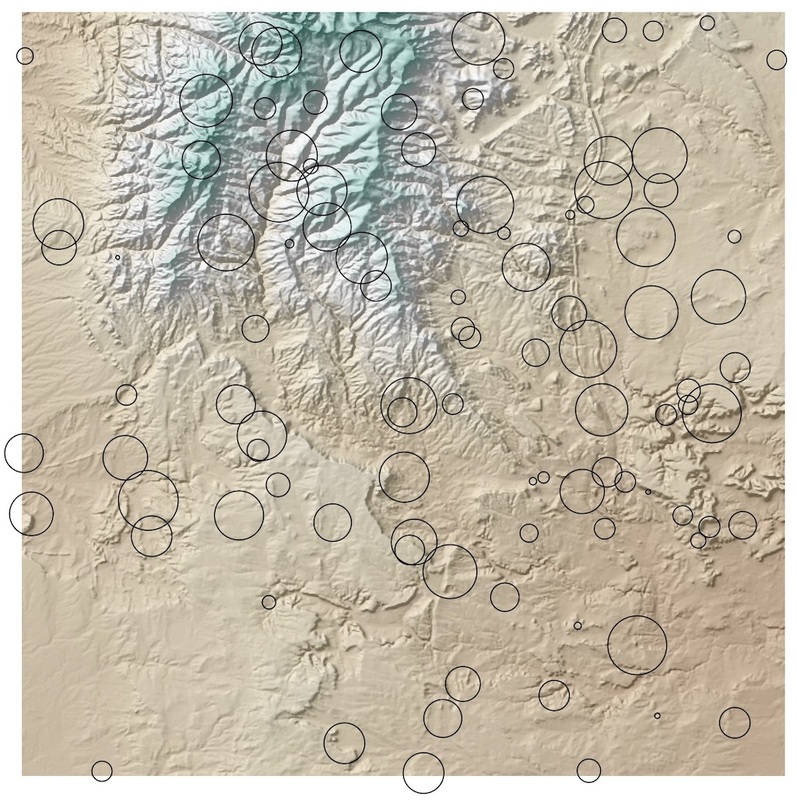 My goal in this article is to demonstrate a PostGIS implementation of zonal stats and compare the results and runtime performance to a reference Python implementation. 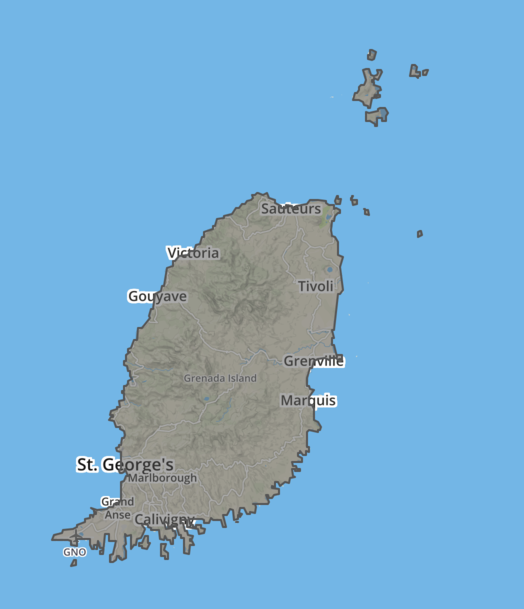 Python with the rasterstats library using GeoTIFF and GeoJSON files. 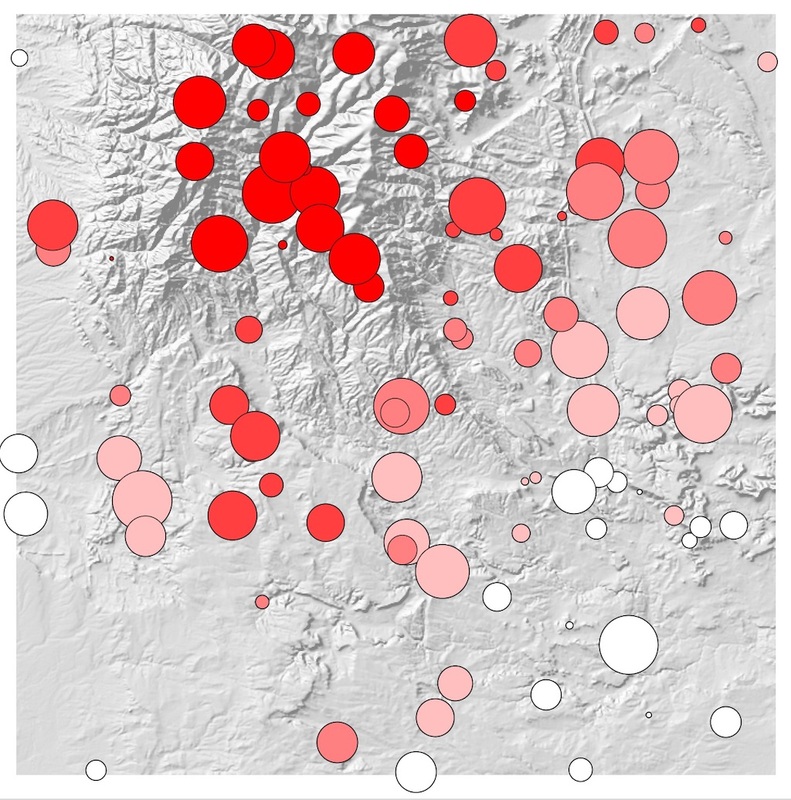 SQL queries using PostGIS raster and vector tables. For the raster data, let's use the ALOS Global Digital Surface Model (from the Japan Aerospace Exploration Agency ©JAXA). I picked a 1°x1° tile with 1 arcsecond resolution (roughly 30 meters) in GeoTIFF format. Next, generate 100 random circular polygon features covering the extent of the raster. The following Python script shows how to do so with the Rasterio and Shapely libs. Piping the features through fio collect gives us a valid GeoJSON collection with 100 polygon features. Using zonal_stats Python function allows you to express the processing at a high-level. Instead of working with GeoTiff rasters and GeoJSON files, we can perform the same thing in PostGIS tables using SQL. To create a raster table name dem from the GeoTIFF. For some rasters, it might be necessary to explictly set the nodata value. Now we can express our zonal stats analysis as a SQL statement. FROM dem, regions does a full product of the 100 regions X 1 raster row. ST_Clip function clips each raster to the precise geometry of each feature. ST_SummaryStats function summarizes each clipped raster and produces a count, sum, mean, standard deviation, min and max column. INTO regions_with_elevation creates a new table with the results. Conceptually, this approach is similar to the internal process used by rasterstats. Compared to attribute table screenshot above, the results are identical for all columns. That isn't too surprising given that both approachs use GDAL's rasterization API under the hood. Performance is a different story. The zonal stats query took 81.90 seconds, roughly 34x slower than the Python code for the equivalent result. In terms of the expressiveness of the two approaches, I can see the appeal of both Python code and SQL queries. Of course this will be personal preference depending on your background and familiarity with the environments. The Python API hides the implementation details and is more flexible, with more statistics options and rasterization strategies. But the SQL approach covers the common use case in a declarative query; it exposes the implementation details yet remains very readable. The performance impact is significant enough to be a deal breaker for PostGIS. I haven't delved into the issues too closely; There might some obvious ways to optimize this query but I haven't found anything as of writing this. PostGIS experts, please get in touch if you find any speedups that I could consider here! Performance combined with the additional overhead of managing postgres instances and data imports tells me that running zonal stats in postgis will not be a great option unless you're already running PostgreSQL. If your application is already committed to postgres and you want to integrate zonal stats tightly into your data management strategy, it could be a viable approach. 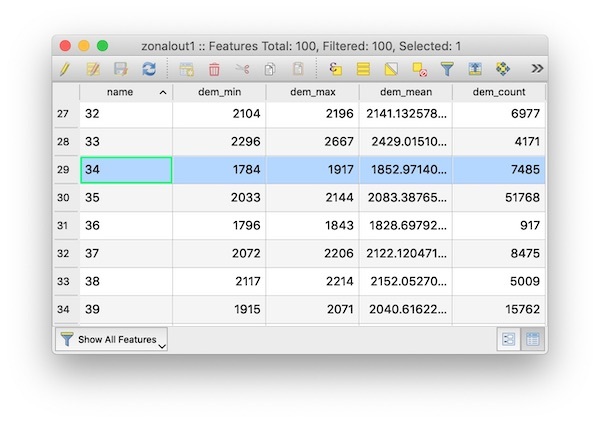 For example, you could create a TRIGGER or an asyncronous worker via LISTEN/NOTIFY to ensure run zonal statistics is run each time a new feature is inserted into your vector table. For most other zonal stats use cases, using rasterstats against local files or in-memory Python data will be a faster with less data management overhead. Working with geospatial vector data typically involves manipulating collections of features - points, lines and polygons with attributes. You might change their geometries, alter their properties or both. This is nothing new. Tools like this have been around since the first days of GIS. Notice the essential role of many of these operations: taking vector data as input, doing some work and producing vector data as output. While conceptually very simple, this logic often gets siloed, tied too closely to our specific implementions, formats, and systems. The following is my take on the best practices for designing and building your own vector processing modules using modern Python. The goals here are not primarily performance but interoperability and composability. The geometry, the geographic component, is just iterables of lon, lat locations - you can represent points, lines, polygons or multis. The properties dictionary holds non-geographic information about the features, analagous to the "attribute table" in many GIS. A quick note on the term "GeoJSON-like Feature mapping"... GeoJSON is a text serialization format. When we take GeoJSON and translate it into a python data structure it is no longer GeoJSON but a python dictionary (mapping) which follows the semantics of a GeoJSON Feature. From here on out, I'll just refer to this GeoJSON-like python data structure as a feature. If you're writing functions that work with vector data, they should accept and return features. Functions should take features as inputs and yield or return features. In other words, features in, features out. That's it. It's really that simple, and the simplicity buys you a great deal of potential. Functions which fit this convention will not read or write to anything outside of locally-scoped variables. Does your function need to read from a file or write to the network in addition to processing features? Why should one function be responsible for doing multiple tasks? We're striving for functions that do one thing - process vector features. You might be concerned about memory. But don't worry, well-behaved Python libraries can use generators to load the data as needed. Another way to picture it is that your application should build an IO sandwich with all of the reading and writing happening outside of your processing function. Processing functions should not care where their input features come from or where the output features are going. As long as process_features takes and returns features, any number of combinations are possible. When possible, you should strive for pure functions; avoid mutating data and return a clean copy. Unless you have specific reason, leave the original feature intact except for the thing your function is expected to manipulate. For instance, if your function just alters the geometry, don't drop or change existing properties. There are some cases where it makes sense to collect your features into a collection and return the entire thing at once. This will generally occur if the features are not independent. In many cases though, your features will largely be independent and can be processed one-by-one. For these situations, it makes sense to use a generator (i.e. yield feature instead of return features). Finally, you should aim to make your features serializable. You should be able to json.dump() the output features. The properties member should not contain nested dicts which might confuse some GIS formats which require a flat structure. And if possible, avoid extending the json with extra elements outside of properties. and buffering them by 10 units. So the python interface is looking good. What if we wanted to use it in a command line interface? Well luckily click and cligj has got the input covered. The @cligj.features_in_arg reads in an iterable of features from a file, a FeatureCollection or stream of Features. Which we can then use between fio cat and fio collect to process Features in a memory-efficient stream. Writing your vector processing code to follow these simple conventions enables great flexibility. You can use your code in a Python application, a command line interface, an HTTP web service - all based on the same core processing functions. Assuming you can write some glue code to express input and output as GeoJSON features, this will work with any vector data source and is not constrained to a single context. You can use this with any data, anywhere that supports Python. That's a pretty powerful concept, all made possible by the simple convention of features in, features out. With the recent announcement that AWS Lambda now supports Python, I decided to take a look at using it for geospatial data processing. Previously, I had built queue-based systems with Celery that allow you to run discrete processing tasks in parallel on AWS infrastructure. Just start up as many workers on EC2 instances as you need, set up a broker and a results store, add jobs to the queue and collect the results. The problem with this system is that you have to manage all of the infrastructure and services yourself. Ideally you wouldn't need to worry about infrastructure at all. That is the promise of AWS Lambda. Lambda can respond to events, fire up a worker and run the task without you needing to worry about provisioning a server. This is especially nice for sporadic work loads in response to events like user-uploaded data where you need to scale up or down regularly. This article describes my approach to solving the problem of running Python with calls to native code on AWS Lambda. On the EC2 insance, Build any shared libries from source. Create a virtualenv with all your python dependecies. The deployment process is a bit clunky but the benefit is that, once it works, you don't have any servers to manage! A fair tradeoff IMO. 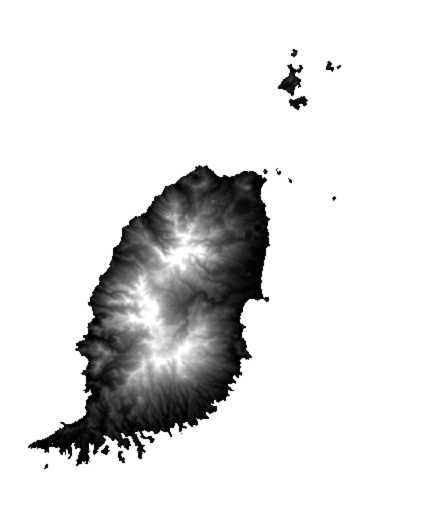 and automatically extract the shape of the valid data region, placing the resulting GeoJSON in the output s3 bucket. Under the hood, your Lambda functions are running on EC2 with Amazon Linux. You don't have to think about that at runtime but, if you're calling native compiled code, it needs to be compiled on a similar OS. Theoretically you could do this with your own version of RHEL or CentOS but to be safe it's easier to use the official Amazon Linux since we know that's the exact environment our code will be run in. Because your Lambda function will run in a clean AWS linux environment, you can't assume any system libraries will be there. Compiling from source isn't the only option - you could install binaries from the Enterprise Linux GIS effort but those tend to be older versions. To get more recent libs, compiling from source is an effective approach. This should leave us with a nice shared library at /home/ec2_user/lambda/local/lib/libgdal.so.1 that can be safely moved to another AWS Linux box. Pretty straighforward but keep in mind that some of the dependecies here are compiled extensions so these builds are platform-specific - which is why we need to build it on the target Amazon Linux OS. The handler's job is to respond to the event (e.g. a new file created in an S3 bucket), perform any amazon-specific tasks (like fetching data from s3) and invoke the worker. Importantly, in the context of this article, the handler must set the LD_LIBRARY_PATH to point to any shared libraries that the worker may need. It's important that the handler function does not import any modules which require dynamic linking. For example, you cannot import rasterio in the main python handler since the dynamic linker doesn't yet know where to look for the GDAL shared library. Your can control the linker paths using the LD_LIBRARY_PATH environment variable but only before the process is started. Lambda doesn't give you any control over the environment variables of the handler function itself. I tried hacks like creating new processes within the handler using os.execv or multiprocessing pools but the user running the lambda function doesn't have the necessary permissions to that (both give you OSErrors - [Errno 13] Permission Denied and [Errno 38] Function not implemented respectively). Fortunately, Lambda lets you call out to the shell so we can just do our real work through a worker script exposed as a command line interface (details in the next section). While at first this feels clunky, it has the side benefit of forcing separation of your AWS code from your business logic which can be written and tested separately. The worker script can be written in any language, compiled or interpreted, so long as it follows the basic rules of command line interfaces. We're using Python in the handler to set up the appropriate environment. For this example, the worker will also be written in Python because of it's awesome support for geospatial data processing. But it could be written in Bash or C or just about anything so long as it's runtime environment can be configured with environment variables and arguments. Notice how the worker itself has no knowledge of AWS events or S3 - it works entirely on the local filesystem and thus can be used in other contexts and tested much more easily. Uploading a raster dataset to your S3 bucket should now trigger the Lambda function which will create a new GeoJSON in the output bucket. All automatically invoked based on the S3 events and completely scalable without having to worry about managing or provisioning servers. Nifty! The worker and handler code above are intentionally kept short to be more readable. In real usage they would need significantly more error handling and conditionals to handle edge cases, malformed inputs, etc. It remains to be seen if this approach is faster or cheaper than a queue-based system with autoscaled EC2 instances. If you're doing a constantly-high workload with lots of data, it's probably safe to say that Lambda is not appropriate. If you're doing sporadic workloads with some discrete processing task based on user-uploaded data, Lambda might be the ticket. The primary advantage is not necessarily speed or cost but reduced infrastructure complexity and hands-off autoscaling. The Pi is wired up to a 3.3v circuit with a photoresistor. The state of the digital input pins are read by a python program. The readings are streamed to a websocket via log file. The photoresistor provides increased resistance to electric current as the visible light becomes dimmer. Conversely, resistance decreases as light becomes brighter. It is an analog sensor but the Raspberry Pi only has digital inputs (the general purpose input output or GPIO pins). To solve that, we can employ a capacitor using "RC timing". 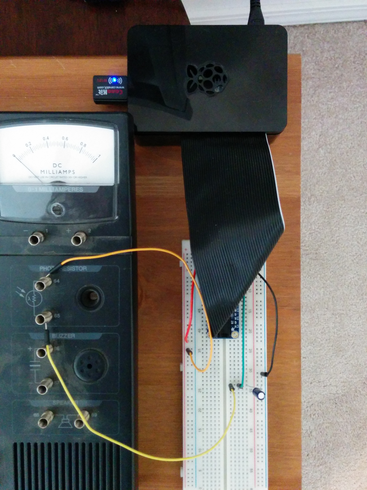 A capacitor builds up voltage over time and, when this voltage hits ~1.4V, the digital input pin reads "high". So instead of taking a direct analog reading, we set a loop and time how long it takes for the capacitor to "fill up". If the time interval is small (i.e. the capacitor is charging rapidly), there is less resistance from our analog sensor which means more light. If the time interval is large (i.e. the capacitor is taking a long time to charge on each cycle), there is more resistance and less light. Quick side note: The ribbon and connectors between the raspberry pi and the breadboard are called a Pi Cobber. It makes working with the GPIO pins easier but, as you can tell from the photos, the incoming cable obstructs access a bit. I might take a look at the T-Cobbler which promises to clear up some vertical space on the breadboard. In order to read input from our analog pins, we can use the RPi.GPIO python library. flush the output to stdout after every reading to make sure the output isn't buffered. You can read the complete read_sensor.py script on github. It's important to note that, on a Linux machine, you can't be guaranteed that your event loop won't get interrupted by other processes. So you probably shouldn't use Linux as a real-time sensor platform directly. However, it works well enough for demonstration provided your Raspberry Pi isn't bogged down by other CPU-intensive processes. Another caveat with this approach - we can only use a single process to access the GPIO pins in this manner. Having multiple processes or threads setting/reading GPIO pin states would cause inaccuracies as each process could reset the pins mid-cycle and interrupt the timing of other processes. Websockets are an extension to HTTP that allow data to be sent from a server to a client using a persistent connection. Think pushing notification messages. websocketd allows you to take the standard output from any unix program and publish it on a websocket. It can also work with standard input, opening up the doors for some amazing software workflows: imagine taking any well behaved Unix command and immediately wrapping it's functionality in a web protocol! Then I will run websocketd on port 8080, serve a few static files and provide a command to run. In this case, the command is the basic unix tail -f which streams the contents of the log file. Now the sensor readings are being logged and a websocket server is running. 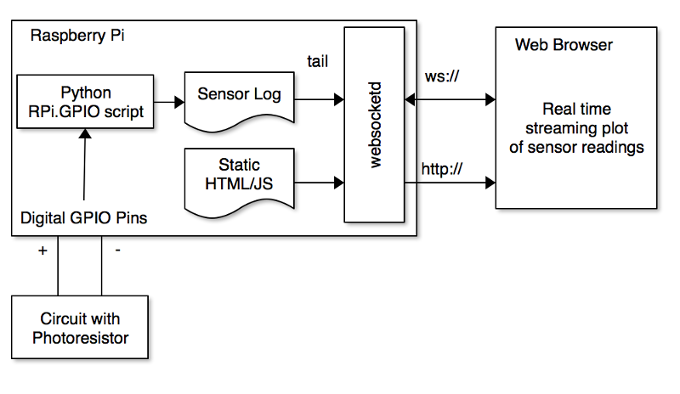 For each client that connects to the websocket, a new process (tail -f log.txt) will be started and stdout will be streamed to that client via websocket messages. Note that the tail -f command is not yet running until a websocket client makes a connection. Because it runs in its own process and simply reads the sensor log file, we can start as many of them as our hardware can handle. In summary, the pattern is: run a single process that reads from the GPIO pins and writes to a sensor log, then fire off multiple processes that read the log and stream the output over websockets. Now we're ready to test it. then set some callbacks to handle incoming messages from the server. Websockets are built into almost every modern browser so this functionality works out of the box. But if the connection is lost for any reason, the native Websocket implementations do not automatically reconnect. To solve that problem, there is ReconnectingWebSocket which does exactly what it sounds like; attempts to reconnect automatically when needed. All of the HTML and js can be found here: index.html. Finally, here is the result. A streaming, real time plot of sensor readings. This clip was recorded as I came into my office, opened a few windows and turned on a light. As the room gets brighter, you can see the sensor readings drop, and then rise again as I pass my hand over sensor a few times to block the light. Maybe not incredibly useful in it's current state but it provided an excellent learning experience to work on the entire stack, integrating electronics and hardware with web software. It opens the doors for all sorts of new projects. All of the code is available on my github repo. Any questions? Shoot me an email or message on twitter. I'm a beginner when it comes to electrical theory so somebody please correct me if I'm way off the mark on something.